I don’t know what I’d do without snacks. Granola bars, fruit, string cheese, and handfuls of nuts sustain me between meals. There’s nothing wrong with having a snack, as far as I’m concerned, and in a lot of cases it’s absolutely necessary to keep body and brain going! My morning snacks are usually some kind of granola bar, lately these, a handful of trail mix, or various more complicated things if I’m at home. It’s protein and healthy fat that keeps me going through the rest of the morning. After weeks of packing the same snacks for all my work days I finally got sick of them last week. Not only was I bored with what I was eating, but I was also tired of spending money on pre-made snacks. The solution: make muffins! 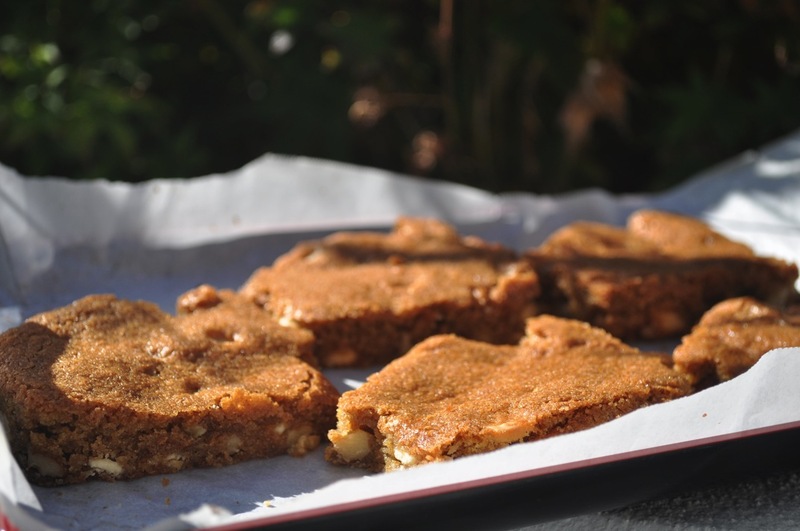 Last weekend was a relatively quiet one – perfect for baking. Lee was invited to race on a boat on Saturday and had to work all day Sunday (ah, startups). I stayed home and relaxed with the dog. That was probably our last weekend at home for a while so I soaked up the leisure time while I could. I thought about projects that need doing but didn’t really accomplish much. Finally planting our backyard herb garden still had me feeling accomplished from the weekend before. On Sunday I pulled various ingredients out of my ugly pantry cupboards (I swear I’m going to rip those things out one of these days. That’s one of those projects…). I made something new that I hoped would meet my morning snack needs for the coming week. With trail mix as my inspiration and chocolate as my canvas, I chopped, stirred, and sprinkled my way to chocolate trail mix muffins. If your coconut oil is solid, measure 1/4 cup into a small oven-proof dish and place in the oven to liquify while the oven preheats. Separately, lightly beat the egg in a medium-sized bowl. Then add the buttermilk, sugar, and oil (you may want to allow the oil to cool for a couple of minutes after taking it out of the oven). Thoroughly blend wet ingredients before stirring in almond extract. Add wet ingredients to dry and stir gently until barely combined. Add almonds, sunflower seeds, and prunes and fold into batter, being careful not to over stir. Spoon batter into a prepared muffin tin (lined with paper or silicon muffin cups or coated with oil). 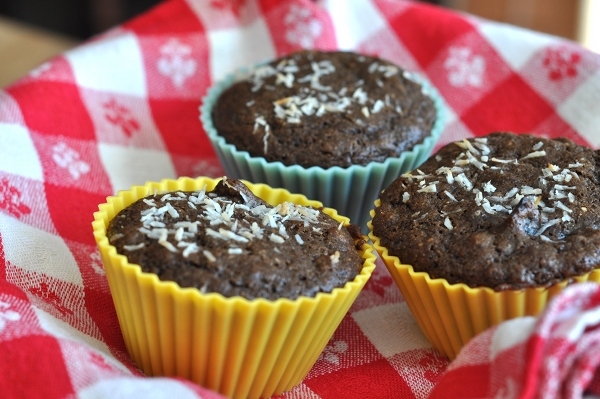 Sprinkle the muffin tops with shredded coconut. 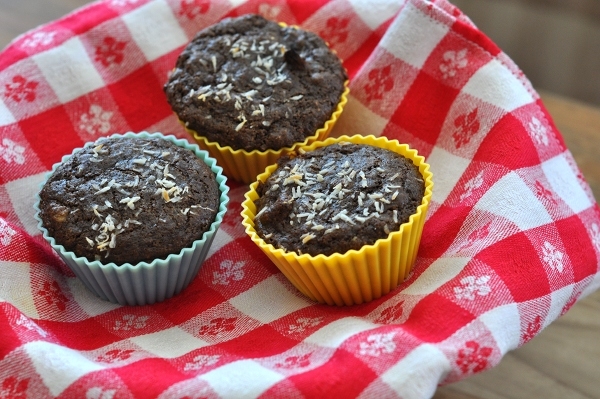 Bake at 375 for 15-18 minutes or until muffins are firm and the coconut has just begun to brown. 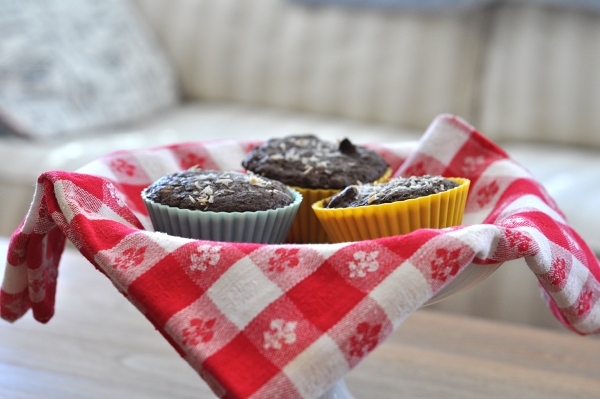 Remove muffins from oven and cool on a wire rack. 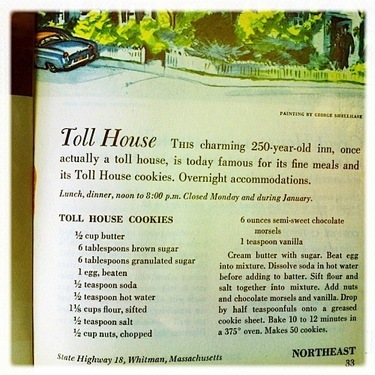 I didn’t do a ton of baking as a kid but I do remember making Toll House chocolate chip cookies with my mom. I know they were Toll House because I remember reading the recipe off of the yellow bag. Though it didn’t happen often, for me cookie baking meant valuable lessons in how to use the stand mixer. It was big, heavy, more than a little scary with all those moving parts, and absolutely essential for perfect cookies. Until very recently, I didn’t have a mixer of my own. My grandmother’s KitchenAid coming to live with me just happened to correspond with this cookie recipe swap. Creaming butter and sugar has never been so satisfying! I wanted to use a “healthier” fat and just experiment with a different version of the traditional cookie. I forgot to buy butter. I’d say the real reason is some combination of the above…but mostly number 2. Butter was on the grocery list. I meant to use it, really I did. I’m just not a big butter user so it didn’t make it into my basket. No problem. I had coconut oil! Since it’s solid at room temperature and has such a lovely flavor, I sometimes substitute coconut oil for butter in my baking. While it’s not the same as something made with butter, I think the flavor and texture of these cookies is outstanding. Cranberries would have been a good addition. Add some if you want! They’ll be pretty! In the bowl of a stand mixer, cream together coconut oil and sugar. Add egg and vanilla bean scrapings. Dissolve baking soda in hot water and then add to batter. Sift flour and salt together and add to mixer a little at a time until completely incorporated. Stir in nuts and chocolate morsels. Line a baking dish (mine is 11×7 in. but a bigger one would be better) with parchment paper. Spread cookie dough over paper to cover the bottom of the dish. The dough will be relatively soft so this is actually pretty easy. Bake at 375 for 15-20 minutes or until golden brown. Remove from oven and let cool. 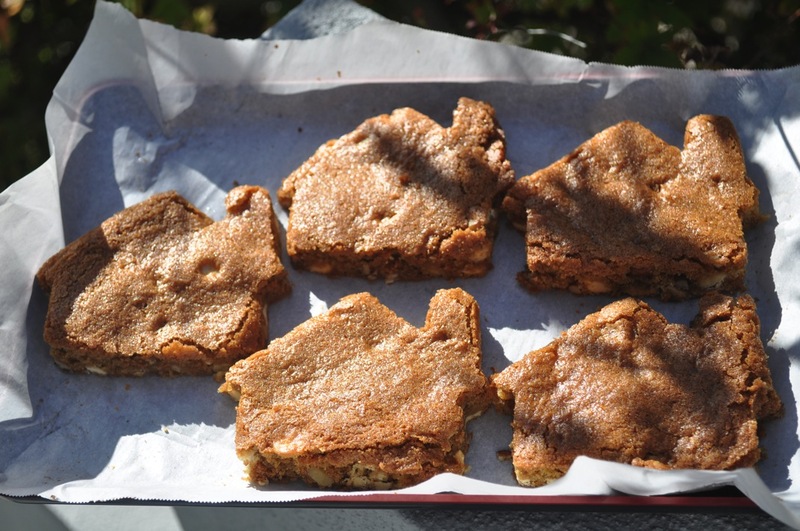 You can lift the “cookie” out of the dish and onto a wire rack using the parchment paper. 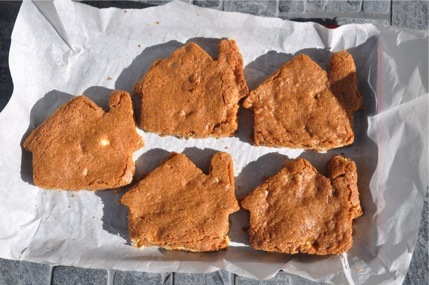 Once the cookie is cooled, cut out house shapes in as efficient a pattern as possible. Start looking for a giant milk moat for your houses! Duh, they’re not pumpkin muffins. Why not? I’m still holding out, still not baking with pumpkin until I feel ready to fully embrace fall. I am determined to find the other flavors that bring this season to mind. Toasted hazelnuts are a fall flavor, right? I can’t say that I’ve ever purchased or even thought much about hazelnuts until I filled a sack with raw ones from the bulk bins last week. I was inspired by this post from The Healthy Foodie to make my own hazelnut butter. Before I knew it, the nuts were in a batch of muffins rather than jars of homemade spread. Next time, hazelnuts. 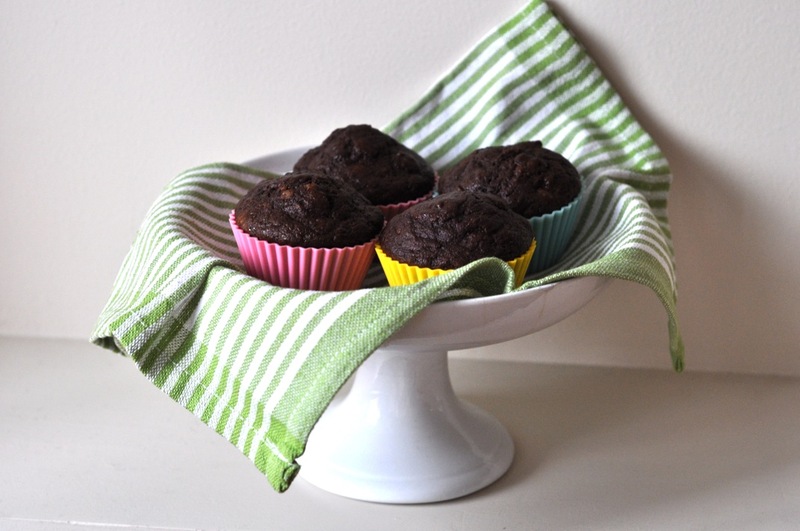 If you want something light but chocolatey, with some crunchy nuts and rich hazelnut flavor (which I might describe as sweet and sophisticated) then these muffins are for you. I’ll be honest. I was going for a mocha hazelnut muffin but somehow the coffee flavor didn’t make it to my taste buds. I didn’t miss it. I had Peet’s Cafe Domingo to sip alongside my mid-morning snack muffin…or dessert…or quick, healthy breakfast. Peet’s sent me these new roasts as part of the FoodBuzz Tastemakers program. They also sent this coupon for you, my lovely readers! 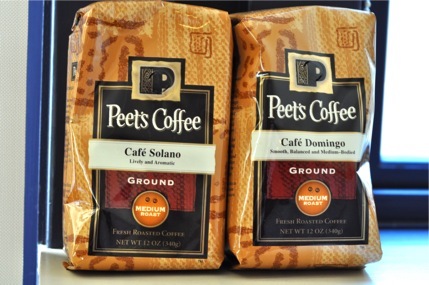 The balanced blend of Central and South American coffees in Cafe Domingo had the “pure coffee taste” that Peet’s touted in literature on their new medium roast coffees. It doesn’t take a culinary genius to realize that coffee and chocolate snuggle up together to make a perfect buzz of nourishment and, for me, comfort. That may seem like a statement full of contradictions but a good cup of coffee and a chocolatey, nutty, healthy muffin really do trigger happy, calm feelings in me no matter what time of day I’m consuming them. On a related note, I’m getting my new(old) mixer at the end of the month! My mom and aunt retrieved it from my grandmother’s house last month. I can’t wait to have this all-important device for a baker and I will think of my grandmother’s lemon bars ever time I use it (lemon bars were probably the last thing she baked for me, maybe the last thing she ever baked). Muffins were the perfect thing to bring me comfort this week. It’s been tough adjusting to my two internships that occupy a full 3 days of the workweek! I know, I’m a wimp. It’s just been a long time since I’ve had a “job” to go to. I’m surviving, though. I baked muffins. I took them with me. I commuted by bike, bus, and BART. I made claymation movies and helped middle schoolers with science projects. Most of my food became mobile but I managed not to starve. 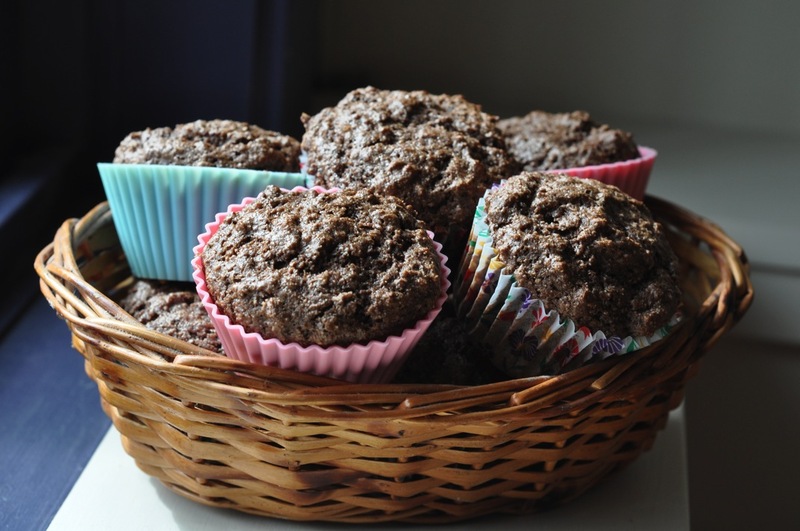 As a busy fall workday-tested recipe, I give these muffins an A+! Check out this post for great instructions on roasting hazelnuts, or buy them already roasted. Once you have your nuts taken care of, chop them finely by hand or in a food processor. Set aside. Preheat oven to375 degrees F.
In a large bowl, whisk together flour, baking powder, baking soda, cinnamon, salt, and cocoa powder. 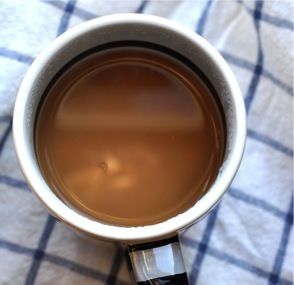 Separately, beat eggs, buttermilk, applesauce, agave, and coffee, stirring in vanilla at the end. Pour liquid ingredients into dry mixture and stir gently, folding in hazelnuts and stirring just until batter is barely combined. Spoon batter into prepared muffin cups and bake for 18-20 minutes, or until the tops of the muffins are firm and a toothpick inserted in the center of one comes out clean. Although I didn’t try it, I’m betting these would be delicious with a little peanut butter spread on them! I had to make muffins yesterday. I mean, I really, really wanted muffins. For once, It wasn’t hard to decide what to make. I wanted a stick-to-your-ribs snack and could double as dessert. 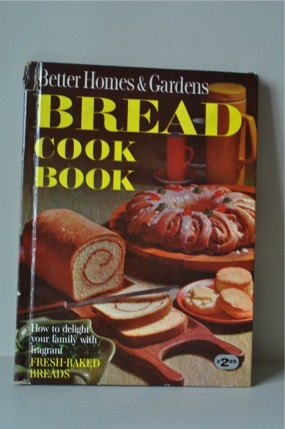 Out came my new(old) Better Homes and Gardens Bread Cook Book that I picked up at a thrift store last week. 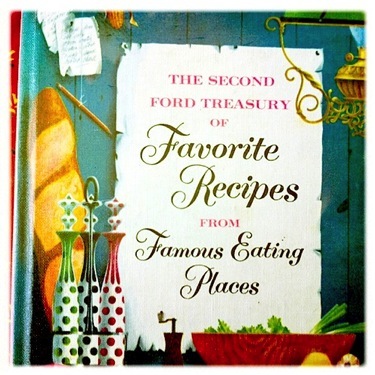 I love thrift store cookbooks. Whoever gave them away was bored with the recipes or never used the book in the first place. I feel like I’m giving these relics of past eating styles a second chance. Besides, certain things never change. Muffins were more or less the same in the 80’s, right? I thought I’d remembered seeing a peanut butter muffin recipe when I scoured my new cookbook for potential winners. I was right and it was the perfect recipe to adapt to my tastes and pantry. I don’t have any straight peanut butter at the moment so out came the giant jar of almond butter. Then there was my chocolate craving…that had to be addressed. I swapped some flour for cocoa powder and used whole wheat flour instead of the all purpose called for. The result was…not as good as I had hoped. 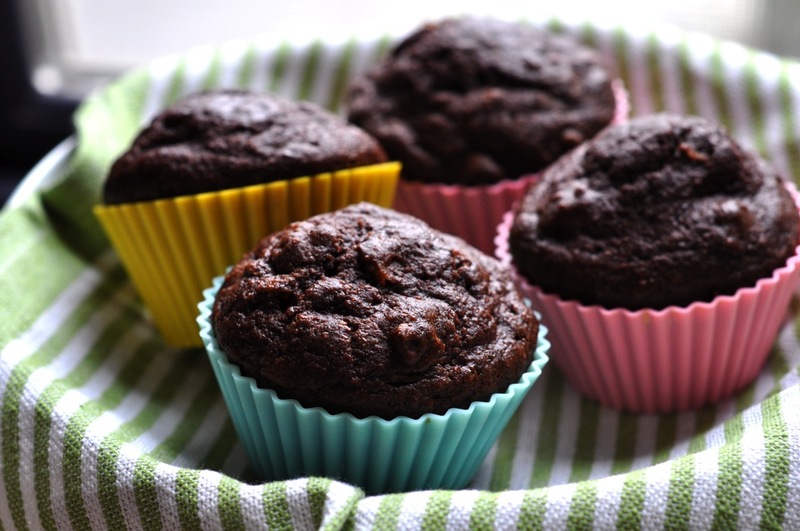 These muffins are a bit dry as I made them but I think that could easily be righted with the addition of some mashed banana, applesauce, or yogurt. 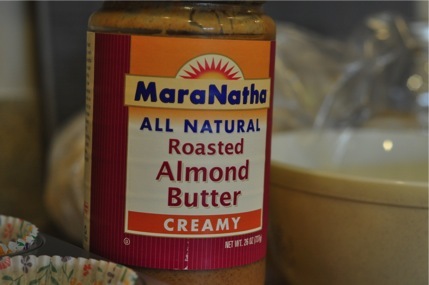 Cut in almond butter until mixture resembles course meal. Add milk, eggs, and other liquid ingredients all at ounce. Spoon into lined muffin tin. Bake at 375 for 15-20 minutes or until muffins are crusty on top and smell good! Cool for at least 30 seconds before eating!